Today we took part in the Sutton Bioblitz at the local ecology centre. We arrived around 11.30am and collected our recording sheets and activity booklets for the kids. The area had been split into three zones, aqua, amber and jade. As you recorded in each zone the kids got a stamp in their booklet and once you’d been to all three zones you got a free garden wildlife calender. We started off in the aqua zone, where they were pond dipping. As I was on my own with the kids today I decided against looking in the main pond – see here for what happened last time – so we got our nets and looked in the smaller raised ponds. We spent quite a long time pond dipping and found lots of different animals including damselfly larvae, lesser water boatman, a whirligig beetle, a ramshorn snail, a pond snail and mosquito larvae. We were so engrossed in finding and identifying that I completely forgot to take any photographs! But I did get this one after we had put the nets away and I was trying to convince Jasmine to move on to something else. 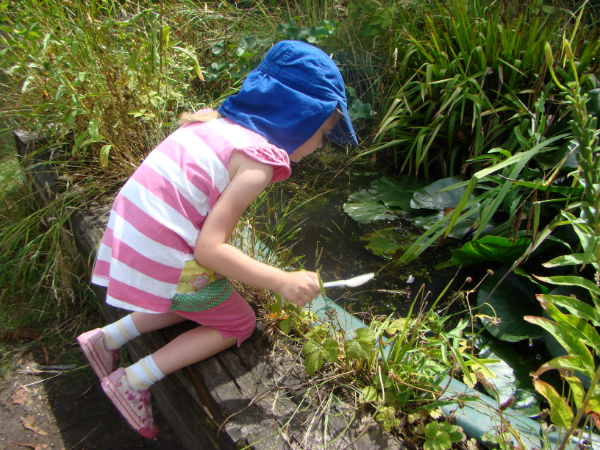 Once I had convinced all the children we should stop looking in the pond and do the next activity we moved into the amber zone to look for bugs. We didn’t really find many today, just the odd woodlouse and snail; I imagine because all the logs had been turned over several times previously! On the volunteers table however, we did see this Eurycantha, or New Guinea Spiny Stick Insect. Pretty scary looking if you ask me, but both Thomas and Jasmine were very keen to hold it. So, after holding the giant stick insect and finding no minibeasts, we headed over to the meadow to complete the final activity and collect our last stamp. In the meadow we did some butterfly catching with nets and discovered how hard it is to catch, and then keep the butterfly in the net! I did most of the catching and got a few butterflies in the net but took a long time to work out how to keep them there! The only one I managed was a ringlet butterfly. While we were there though someone caught a small blue butterfly, the first one of the day. As i was trying to catch butterflies, Jasmine and Thomas had found a volunteer turning over logs looking for toads. He found a couple and then as I was chatting to him all 3 kids began their own toad hunt. 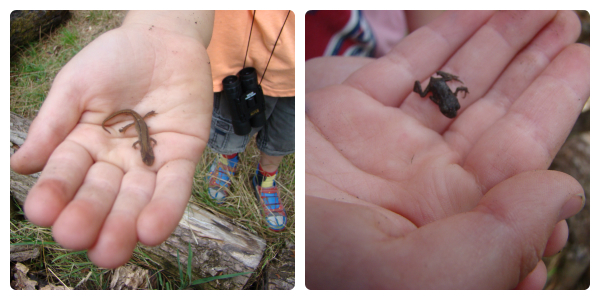 They did well and Jasmine brought over a small toad and Thomas found a newt. It was now almost 2pm and we still hadn’t had any lunch. We went to get our calenders and wrote comments on the event tree. Thomas wrote “I found a newt” and Jasmine wrote “I found a toad”! While Thomas was writing Jasmine did a spot more bug catching and managed to catch a couple of grasshoppers by herself! Her eye for spotting and her ability to catch almost any small bug astounds everyone and the volunteers nearby were very impressed with her patience! But then it was time to leave. I don’t think any of the kids had thought about how hungry they were while we were there because they were having so much fun. But I bought them all a cake on the way out and suggested we go to Macdonalds for some chips, and I didn’t have too many problems getting them back to the car! We had a really great time today and each time we do something like this I see the kids enthusiasm grow and grow. We’re so lucky to have such a wonderful place nearby! A full day of educational fun! 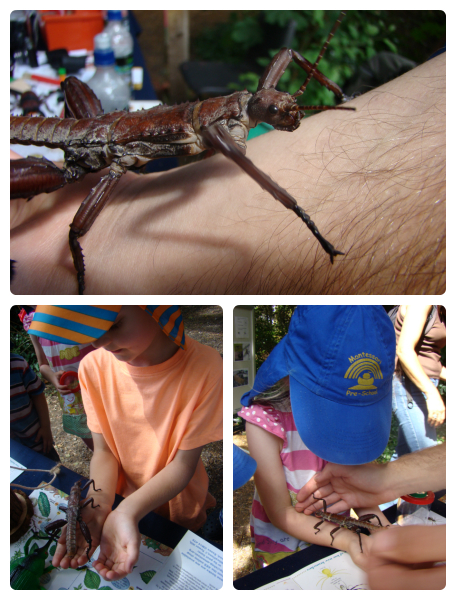 Your children are very brave holding that giant stick insect, I definitely wouldn’t. A lovely day of activities that obviously kept them entranced, thanks for sharing with Country Kids. What a magical place. So much wonderful wildlife fun. You are very lucky to have this nearby! Sounds like a lovely place. we used to love bugs when we went to Watch groups when we were younger. I’m hoping if n finds bugs on the farm, that he leaves them outside!